LOCATION.--Lat 42°07'01", long 74°22'49" referenced to North American Datum of 1983, Ulster County, NY, Hydrologic Unit 02020006, on right bank 20 ft downstream from bridge on Fox Hollow Road, 200 ft downstream from Fox Hollow Creek, 600 ft upstream from Peck Hollow Creek, at Allaben. PERIOD OF RECORD.--Occasional low-flow and/or miscellaneous discharge measurements, water years 1941, 1956-61. October 1963 to current year. Prior to October 1988, published as "at Shandaken" (01362198). GAGE.--Water-stage recorder and crest-stage gage. Datum of gage is 998.04 ft above NGVD of 1929 and 996.98 ft above NAVD of 1988. Prior to Nov. 22, 1988, at site 0.5 mi upstream at datum 19.23 ft higher. REMARKS.--Occasional slight regulation when filling or draining swimming pools or small ponds upstream from station. 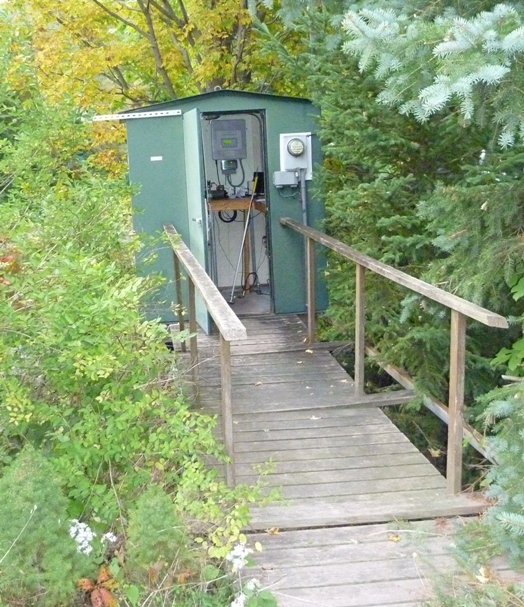 EXTREMES FOR PERIOD OF RECORD.--Maximum discharge, 29,300 ft³/s, Aug. 28, 2011, gage height, 16.34 ft, from rating curve extended above 3,700 ft³/s, on basis of runoff comparison of peak flows from contracted-opening measurements at gage heights 14.44 ft and 16.34 ft at site 1.0 mi upstream; minimum discharge, 2.1 ft³/s, Sept. 16, 1983 (result of slight regulation upstream from station). EXTREMES OUTSIDE PERIOD OF RECORD.--Flood of Mar. 30, 1951 reached a stage of about 15.1 ft, at previous site and datum, from information supplied by local residents, discharge about 20,000 ft³/s, on basis of slope-area measurement of peak flow. Flow exceeding 1,000 cfs may cause backwater and affect the stage-discharge relation at Diversion from Schoharie Res (01362230).